At age 4 in the summer of 1953 while at home in Derby, Maine, I had my first lesson in face to face sales. Those were innocent times in an era when door to door salespersons were usually welcome. Today, at least in some places, you’re more likely to be met by a growling dog or 38 special. I still remember that one salesman who came calling with a handful of Melmac dinnerware, and me standing next to Mom to hear the sales pitch. 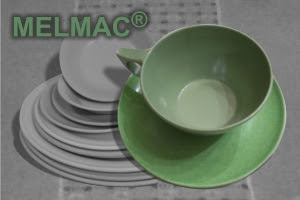 Sets were available in a variety of vibrant colors, easy to clean, and on and on. The clincher came when he bounced a cup off the kitchen floor, and then another. Mom was unimpressed, and not buying, but I eventually closed the sale hanging off her apron and pleading. They did last. There were some still in the cupboard 20 years later when I returned as an adult. In the years since, my career has included closing multi-million dollar sales, and I believe my success may have begun that day in 1953. Perhaps the most outrageous sales experience was years later at the annual flea market in Damariscotta, Maine. My sisters, Mom, and my wife each had tables and needed assistance towards the end of the day getting rid of difficult items. A biker picked up a ceramic thingamabob with candle holes and a religious theme priced at 50 cents, and seemed sincere before placing it down and walking away. Coming to the rescue, I called out to ask if he would take it away for a nickel. He turned, paused, then returned and gave it another look before deciding to take it. As he reached in his pocket I handed him 5 cents and thanked him for agreeing to take it away for a nickel. I did not smirk. I did not smile. This was good ol’ dry Maine humor at its best. Everything that was left went into a mystery box. This was announced loudly to anyone within earshot, and they could not peek at the contents, but “Who will take away this mystery box for 50 cents.” It took 5 minutes to sell, but the look on that old man’s face as I handed him his 50 cents was precious. Just like the biker, he left shaking his head and wearing a big grin. They were happy. We got to go home.